Residents of Cal Shasta, a community on the southwestern shores of Lake Nacimiento, are waiting on Monterey County officials to determine if they'll be allowed to rebuild homes destroyed by the Chimney Fire nearly two years ago. 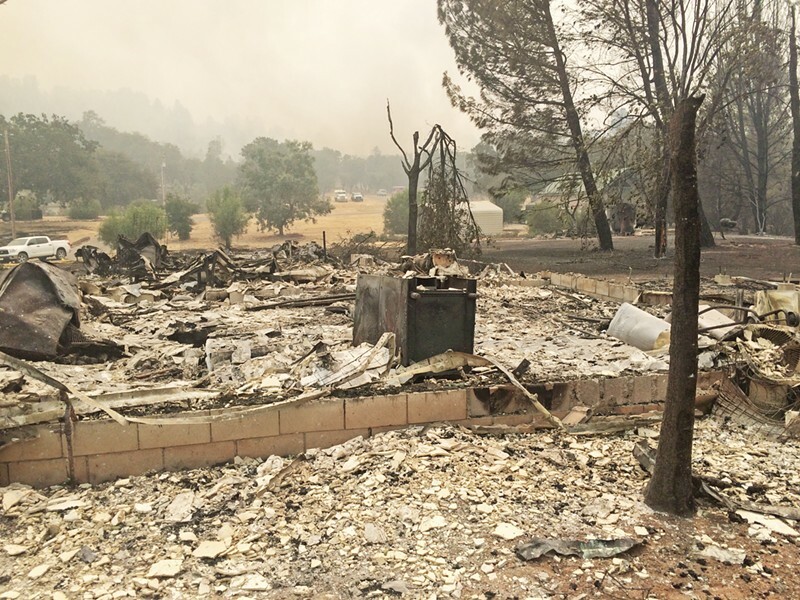 FIRE VICTIMS STYMIED Monterey County may prevent seven victims of the 2016 Chimney Fire in Lake Nacimiento from rebuilding homes due to their location in a county floodage easement. Seven of the 27 homes scorched in Cal Shasta—the hardest hit lakeside village in the 2016 blaze that toppled 49 homes in total—are located below Lake Nacimiento's 825-foot elevation mark, where the Monterey County Water Resources Agency (MCWRA) owns a floodage easement running the perimeter of the reservoir. While fire victims above the 825-foot line can seek rebuilding permits from SLO County, those below it have been subjected to an effort to halt redevelopment by the MCWRA. Agency officials are recommending a new policy that would ban "any new construction within the MCWRA easement, even for reasons of fire damage relief." "The MCWRA easement area is necessary for properly operating and maintaining the Nacimiento Reservoir and its facilities owned by MCWRA," stated a staff report for a March 19 board of directors meeting. The MCWRA board voted to defer a decision on the policy to the agency's board of supervisors. Cal Shasta Club President Steve Demsher told New Times he and several other lake residents attended the meeting to speak in opposition to the policy. "These people who paid a premium to live on the lake—paid taxes for 40 to 50 years, were insured—are now being told by Monterey County you can't put [a house] back," Demsher said. "They are vested structures." More than 100 other structures around Lake Nacimiento are also located within Monterey's easement, according to Demsher, including a Monterey County ranger station. While MCWRA did not return requests for comment from New Times, Demsher said agency officials have expressed concern about a statewide crackdown on dam and reservoir safety following the Oroville Dam emergency last year. "They've built a tremendous amount of stuff in there," Demsher said. "They're afraid the state will say, 'your inundation area isn't free and clear.'" The staff report references recent meetings with the state Division of Safety of Dams and Federal Energy Regulatory Commission where those agencies "requested immediate assurance as to whether all regulations and project boundary terms are being followed." As rationales for the construction ban, MCWRA cites needing "flexibility to accommodate future reservoir related projects; control of storm water run-off into the reservoir; maintenance of an open space; containment of future flooding and provisions for detention, and accommodation of present recreation uses." Demsher said the Cal Shasta Club would consider taking legal action against the MCWRA if the ban is approved by its board of supervisors. While the seven homeowners below the lake's 825-foot marker face the most uncertainty, the Chimney Fire recovery effort as a whole has been a slog for nearly everyone, according to lake residents. SLO County has issued just one building permit in Cal Shasta since the fire, Demsher said. The community was asked to certify its well water system and upgrade other infrastructure prior to rebuilding. "It's just been a horrible, horrible struggle," said Cheryl Dodge, whose Cal Shasta home was the first to burn in the Chimney Fire. Tensions between Nacimiento residents and Monterey County extend far beyond Cal Shasta and the Chimney Fire recovery. More than 2,700 people recently signed a Nacimiento Regional Water Management Advisory Committee (NRWMAC) petition in opposition to Monterey County's proposed "water release" schedule for the reservoir this year. Per a Feb. 15 draft of the schedule presented at a reservoir operations committee meeting, where NRWMAC has a seat, MCWRA plans to dump 400 cubic feet of water per second—or 2,992 gallons—out of Nacimiento and into the Salinas River between April and July. The result, according to the plan, will be a more than 40-foot drop in the lake's elevation by July. It's an "unprecedented" proposal, according to NRWMAC's petition. Community members are concerned that the plan will leave the lake's marina and most boat ramps dry by summertime, and negatively impact recreation and the local economy. "There will be no gas available at the Marina, the resort will be forced to layoff personnel, and many docks and most launch ramp around the lake will be unusable," the petition reads. NRWMAC board members and SLO County 1st District Supervisor John Peschong told New Times that MCWRA didn't give the committee an explanation for the release plan. "I'm still trying to understand the reason why they're doing it," Peschong said, adding that he's concerned about lake safety during the summer when recreation hits its peak. According to NRWMAC, the petition will be presented to the State Water Board, the SLO and Monterey County Board of Supervisors, and the MCWRA. When water is released from Lake Nacimiento via its dam, it flows north down the Salinas River to aid farmers in the Salinas Valley and recharge the underground aquifer, before emptying into the ocean. In addition to opposing the release plan's impact on Nacimiento recreation, lake residents questioned the wisdom of sending water down the river in the spring. "What's going to happen is when the lake gets down in July, they're not going to have any water to release, and that's when the farmers are going to need it the most," Demsher said. Locals are also concerned about whether the lake will replenish next winter.